This article explains the IoT services and the layers in the IoT. Now that we understand what the Internet of Things (IoT) is, let’s understand some more things about this technology. If you are still wondering what the IoT is then read this, you will have a clear understanding of the IoT. Four things form basic building blocks of IoT system –sensors, processors, gateways, applications. Each of these nodes has to have their own characteristics in order to form an useful IoT system. These form the front end of the IoT devices. These are the so called “Things” of the system. Their main purpose is to collect data from its surrounding (sensors) or give out data to its surrounding (actuators). These have to be uniquely identifiable devices with a unique IP address so that they can be easily identifiable over a large network. These have to be active in nature which means that they should be able to collect real time data. These can either work on their own (autonomous in nature) or can be made to work by the user depending on their needs (user controlled). Examples of sensors are: gas sensor, water quality sensor, moisture sensor etc. Processors are the brain of the IoT system. Their main function is to process the data captured by the sensors and process them so as to extract the valuable data from the enormous amount of raw data collected. In a word, we can say that it gives intelligence to the data. Processors mostly work on real-time basis and can be easily controlled by applications. These are also responsible for securing the data – that is performing encryption and decryption of data. Embedded hardware devices, microcontroller etc are the ones that process the data because they have processors attached to it. Gateways are responsible for routing the processed data and send it to proper locations for its (data) proper utilization. In other words, we can say that gateway helps in to and fro communication of the data. It provides network connectivity to the data. Network connectivity is essential for any IoT system to communicate. LAN, WAN, PAN etc are examples of network gateways. Applications form another end of an IoT system. Applications are essential for proper utilization of all the data collected. These cloud based applications which are responsible for rendering effective meaning to the data collected. Applications are controlled by users and are delivery point of particular services. Examples of applications are: home automation apps, security systems, industrial control hub etc. In Figure 2, the extreme right block forms the application end of the IoT system. In a nutshell, from the figure we can determine that the information gathered by the sensing node (end node) is processed first then via connectivity it reaches the embedded processing nodes that can be any embedded hardware devices and are processed there as well. It then passes through the connectivity nodes again and reaches the remote cloud-based processing that can be any software and are sent to the application node for the proper applied usage of the data collected and also for data analysis via big data. How the IoT works is quite simple. First, it acquires information with respect to basic resources (names, addresses and so on) and related attributes of objects by means of automatic identification and perception technologies such as RFID, wireless sensor and satellite positioning, in other words the sensors, RFID tags and all other uniquely identifiable objects or "things" acquire real-time information (data) with the virtue of a central hub like smartphones. Second, by virtue of many kinds of communications technologies, it integrates object-related information into the information network and realizes the intelligent indexing and integration of the information related to masses of objects by resorting to fundamental resource services (similar to the resolution, addressing and discovery of the internet). Finally, utilizing intelligent computing technologies such as cloud computing, fuzzy recognition, data mining and semantic analysis, it analyzes and processes the information related to masses of objects so as to eventually realize intelligent decision and control in the physical world. Let’s have a look at the following diagram. In the Physical layer, all the data collected by the access system (uniquely identifiable "things") collect data and go to the internet devices (like smartphones). Then via transmission lines (like fiber-optic cable) it goes to the management layer where all the data is managed separately (stream analytics and data analytics) from the raw data. Then all the managed information is released to the application layer for proper utilization of the data collected. There are four major layers. 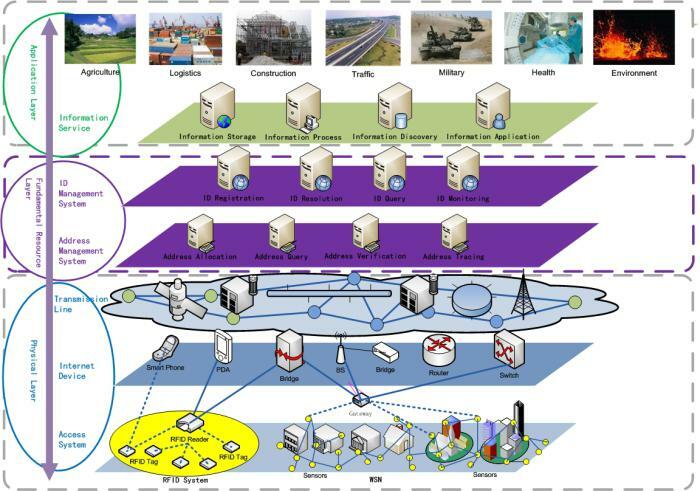 At the very bottom of IoT architecture, we start with the Sensors and Connectivity network which collects information. Then we have the Gateway and Network Layer. Above which we have the Management Service layer and then at the end we have the application layer where the data collected are processed according to the needs of various applications. Let’s discuss the features of each of these architectural layers separately. This layer consists of RFID tags, sensors (which are essential part of an IoT system and are responsible for collecting raw data). These form the essential “things” of an IoT system. 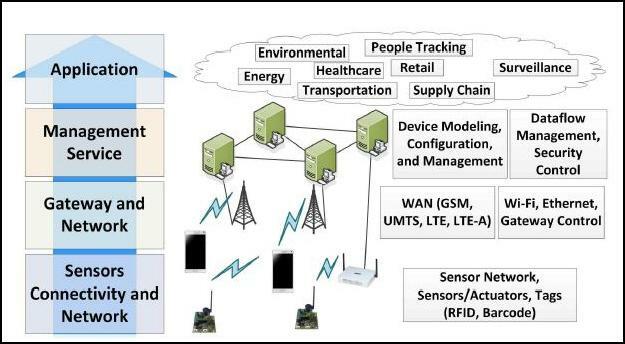 Sensors, RFID tags are wireless devices and form the Wireless Sensor Networks (WSN). Sensors are active in nature which means that real-time information is to be collected and processed. This layer also has the network connectivity (like WAN, PAN etc.) which is responsible for communicating the raw data to the next layer which is the Gateway and Network Layer. The devices which are comprised of WSN have finite storage capacity, restricted communication bandwidth and have small processing speed. We have different sensors for different applications – temperature sensor for collecting temperature data, water quality for examining water quality, moisture sensor for measuring moisture content of the atmosphere or soil etc. As per the figure below, at the bottom of this layer we have the tags which are the RFID tags or barcode reader, above which we have the sensors/actuators and then the communication networks. Gateways are responsible for routing the data coming from the Sensor, Connectivity and Network layer and pass it to the next layer which is the Management Service Layer. This layer requires having a large storage capacity for storing the enormous amount of data collected by the sensors, RFID tags etc. Also, this layer needs to have a consistently trusted performance in terms of public, private and hybrid networks. Different IoT device works on different kinds of network protocols. All this protocols are required to be assimilated in a single layer. This layer is responsible for integrating various network protocols. From the figure below, at the bottom we have the gateway which is comprised of embedded OS, Signal Processors and Modulators, Micro-Controllers etc. Above the gateway we have the Gateway Networks which are LAN(Local Area Network), WAN(Wide Area Network) etc. This layer is used for managing the IoT services. Management Service layer is responsible for Securing Analysis of IoT devices, Analysis of Information (Stream Analytics, Data Analytics), Device Management. Data management is required to extract the necessary information from the enormous amount of raw data collected by the sensor devices to yield a valuable result of all the data collected. This action is performed in this layer. Also, certain situation requires immediate response to the situation. This layer helps in doing that by abstracting data, extracting information and managing the data flow. This layer is also responsible for data mining, text mining, service analytics etc. From the figure below, we can see that, management service layer has Operational Support Service (OSS) which includes Device Modeling, Device Configuration and Management and many more. Also, we have the Billing Support System (BSS) which supports billing and reporting. Also, from the figure, we can see that there are IoT/M2M Application Services which includes Analytics Platform; Data – which is the most important part; Security which includes Access Controls, Encryption, Identity Access Management etc. ; and then we have the Business Rule Management (BRM) and Business Process Management (BPM). Application layer forms the topmost layer of IoT architecture which are responsible for effective utilization of the data collected. Various IoT applications include Home Automation, E-health, E-Government etc. From the figure below, we can see that there are two types of applications which are Horizontal Market which includes Fleet Management, Supply Chain etc. and on the Sector wise application of IoT we have energy, healthcare, transportation etc. WPAN stands for Wireless Personal Area Network which includes Bluetooth, ZigBee, 6LoWPAN, IEEE 802.15.4, UWB, and so on. Figure 10: Smart Environment Application Domains: Service Domain and their Services classified. That is all for this article. I hope you enjoyed reading! P.S: This article has been previously published on my blog at https://opentechdiary.wordpress.com.